I didn’t make it through the entire Cosmos series when it was on television, but there was something in the first coupe of episodes I watched that stuck with me. The concept of the observable universe is something I’ve known, but the thought that there could be things beyond that had never crossed my mind. To imagine that the universe could be older than the oldest light we have measured simply because that light has not yet arrived was a mind blower. It’s a simple yet powerful thought that reminds me of the limits of human observation. Too many see the idea of a radical librarianship as a sort of extreme political partisanship. That is wrong. Radical librarians see librarianship as a chance to make a positive difference in their community. They see their mission to not simply promote reading, or to inform a community. Instead radical librarians, the kind we need, see their mission as the improvement of society. They see their role and the instruments of their institutions as engaging a community and addressing the issues that have exploded in Ferguson. Addressing these issues not with tear gas and rubber bullets, but through pizza, magic shows, and learning. Radical is NOT pink hair, crazy clothes, over the top programming. Yes, some of the best radical librarians do have different hair styles, dress differently, and have the most amazing abilities to create the most incredible programs, however that is not “Radical” in and of itself. Radical is the library staff member who comes up with the idea that is “outside of the library”, in that it is outside the norms we call the library paradigm. Makes the partnership, creates a service, opens their eyes to what the community needs. They are aware, awake, and in tune with the role of the library as organization can play in their community, beyond books, beyond programs. In reading both concepts, I find myself leaning more towards David’s take. I’m not trying to slight the idea of making a positive difference in a community, but I feel like he’s aiming too low. Like the edges of the observable universe, I wonder at how much further it could go beyond that. I can appreciate the idea that small changes lay the groundwork to larger ones, the core of the common mantra of “think globally, act locally”. But I can’t help but wonder how many of my peers take the first part to heart. I wonder how many define success as getting people to think “wow, I didn’t know the library did that” versus “wow, the way I see the world around me is different”. The attitude about the library should be a byproduct, not part of the goal. To my mind, radical librarianship is not about using the role and tools of the institution to make a positive change so much as it is using all of the resources possible. Like the booster rockets in our forsaken space program, the library is the means to push individuals, groups, people, businesses, communities, etc. beyond the bounds of our Earthly atmosphere. The fuel is a well known but little understood combination of “whatever it takes”: books, music, movies, downloadable content, community partnerships, grants, sponsorships, meeting groups, networking, politicians, and everything including the kitchen sink. If you define issues and situations with the library as a constant factor, then all of your solutions will be constrained by the limitations of the library. It is not about what the library can or cannot do, but what the library chooses or not chooses to do. There is always a choice and context provides the factors for any decision point. The library as an institution is a tool, not the entire toolbox. As for those rockets, they don’t make it to space; they fall back to Earth, recovered, and re-used in the next mission. They also don’t make it to the moon, but they’ve sent a lot of people there. Perhaps the metaphor should have ended further up the page, but I wanted to point out that they were not discarded (at least as part of the Space Shuttle program). But as soon as we treat librarianship as public transit, a means to get people from one end of town to the other, and not a space program for the mind, then there is no longer a need for librarians. The notion of radical librarianship needs to go beyond even what we think it is. It is not about leaving behind current practices, but expanding beyond them. It needs to push boundaries in places we’ve never gone before. A couple of questions have been rattling around my mind over the last week or so. It’s the kind of stuff that lurks in the background and creeps into your mind in the moments between things like commuting to and from work and trying to go to sleep. As you might tell from the time when this is posted, it has been keeping me up to the point where the bed becomes the sum of all irritations: too warm to lay on, the pillows aren’t right, and the sheets won’t settle just right. But enough about that. A few days ago, I sent out a tweet asking if libraries are moving towards building moments or monuments. (For clarification, I meant moments as experience based services and programming and monuments as enduring collections of, well, whatever.) The quick and easy answer is “it depends” because contextually it really does matter based on the community needs as influenced by culture, history, demographics, income, and a myriad of other population statistics. I keep coming back to the phrase “one size fits one”; that there are enough unique factors that make it unwise to generalize aspects of the library when it comes to how it interacts with its service population. The judgment of whether a service, program, or concept is good should not be limited to whether it can be duplicated, but whether it works for the library’s community. However, the kind of thing that really keeps me up at night is thinking whether I’m working on projects for my library that will be one when it should be the other. To torture the terminology some more, it’s the thought that I am making a monument when it should really be a moment. That’s the kind of healthy self-doubt I have, although whether it is healthy for my sleeping habits is another story. Also, another question recurs in my thoughts: if we were building libraries today from scratch, would the final product match what we currently have? Granted, it’s invariably a ‘no’ given the hindsight that exists between when the doors are first opened to the present day. But the service models, the collections, hell, even the buildings: would they be the same? If “no” is the most sensible answer, it does beg the question as to what we can do to change some of our practices to meet that hypothetical “built from scratch” library. Sometimes I pause at work and think, “if this building was opening today, would I still want this (X)?” It really gives me pause at times to look at things for what they are: are we doing it because it’s ideal or because it’s what we’ve always done? Are we doing it because it’s right or because it’s easy? Are we doing it because it’s what the community wants or what we think they want? I’m starting to finally fade so this means a few things: first, I’m not going to be able to edit this so I fully anticipate some missing or misspelled words that will drive me nuts later. Second, even in writing to get these things out, it is starting to bring up more questions. Being a librarian who is an agnostic with anxiety is the trifecta of question generation. “What if” and “what about” are inquiry staples around here. Last, I wonder what other people think about these things. Am I onto something? Or am I just a tired person trying to make sense of his professional life while his mind and bedding rebels against him? 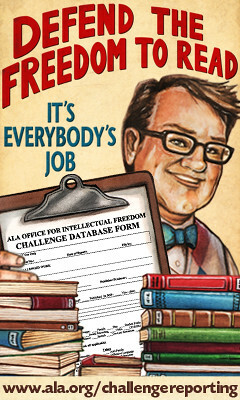 Defend The Freedom to Read: It's Everybody's Job! Click to find out more information about reporting book challenges or removals! 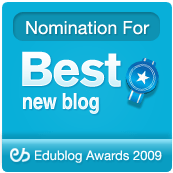 Nominee for Best New Blog 2009, Edublog Awards. Help advocate for libraries and great taste! Click HERE to join the Facebook Group! Join the Lending Librarians Team and help us lend out money to those who need it!